Ideal for size reduction of soft to medium-hard, tough-elastic and fibrous materials as well as for heterogeneous mixtures, FRITSCH cutting mills are indispensable in the areas of environment, plastics, agriculture, forestry, construction materials, textiles, chemistry and foodstuffs as well as for analytic and sample preparation for RoHS-analyses, like for example mobile phone LCD glass, mobile phone keypads, electronic chips, circuit boards. A particularly important criterion for a Cutting Mill is the question how fast and easy it can be cleaned in daily laboratory use. Therefore we have placed particular value on the easy cleaning when we developed the FRITSCH PULVERISETTE 19. While you are still tightening the screws on other mills, your FRITSCH Cutting Mill is already clean! Because the entire grinding chamber can be opened easily in seconds and both the rotor and the sieve can simply be removed with simple motions. Only at FRITSCH Cutting Mills it is possible to lift open the entire top part of the housing as well as the door – in fact, the door can be completely removed. And that’s not all: The rotor of the FRITSCH Cutting Mills can be removed easily without tools for quick cleaning in between and it can be turned by hand, when the mill is open. The result: a completely open and empty grinding chamber with minimal dead space for easy and quick cleaning – a secure protection against cross contaminations! 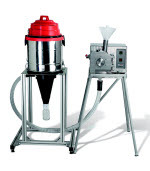 In connection with the PULVERISETTE 19, the patented FRITSCH sample exhauster with Cyclone separator ensures with its powerful vacuum function, based on negative pressure a simple feeding, fast throughput and good cooling, effectively prevents sample material from escaping during feeding and opens up new possibilities in the processing of heterogeneous mixture of materials, such as derived fuels in the cement industry. FRITSCH offers 6 different models of Cutting Mills with comprehensive accessories, with max. feed sizes from 70 x 70 mm – 120 x 85 mm, max. throughput from 50 l/h up to 85 l/h, final finesses from 0.2 – 20 mm, rotational speeds from 300 – 3400 rpm as well as in a corrosions-resistant stainless steel version 316L. For each application the perfect Cutting Mill!